Suzy Klein's guests include conductor Nicholas McGegan. Plus live performance from pianist Leon McCawley, and clarinettist Joseph Shiner with pianist Somi Kim. Suzy Klein with a lively mix of chat, arts news and live music. Her guests include conductor Nicholas McGegan, who'll be at the helm of an historic BBC Prom this Saturday as the festival leaves London for the first time ever for a concert celebrating 300 years of Handel's Water Music in Hull. 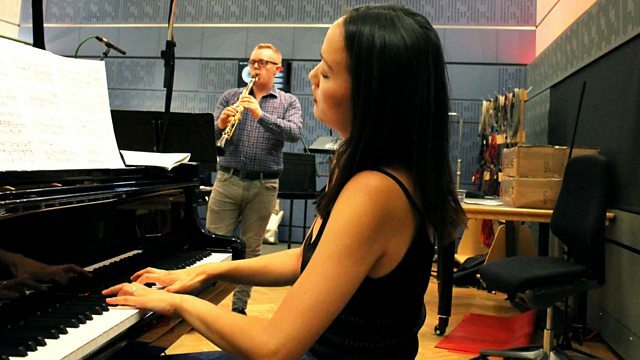 Pianist Leon McCawley plays Ravel, Rachmaninov and Schumann live in the studio, and we also have live music from clarinettist Joseph Shiner and pianist Somi Kim. Simon Rattle conducts British Music. Performer: Joseph Shiner. Performer: Somi Kim. Singer: Sandrine Piau. Singer: Renata Pokupić. Singer: Benjamin Bruns. Singer: Andreas Wolf. Choir: Accentus. Orchestra: Insula Orchestra. Conductor: Laurence Equilbey. Performer: Jean-Efflam Bavouzet. Orchestra: BBC Philharmonic. Conductor: Juanjo Mena. Barber: Piano Works: Leon McCawley. Performer: Alisa Weilerstein. Orchestra: Staatskapelle Berlin. Conductor: Daniel Barenboim. Elgar, Cello Concerto; Carter; Bruch. Orchestra: Chineke! Orchestra. Conductor: Kevin John Edusei. Dvořák: Symphony No. 9, From the New world - Sibelius: Finlandia. Orchestra: Philharmonia Baroque Orchestra & Chorale. Conductor: Nicholas McGegan. Conductor: Nicholas McGegan. Orchestra: Philharmonia Baroque Orchestra & Chorale. Handel: Water Music: Philharmonia Baroque Orchestra/McGegan. Mendelssohn: Felix & Fanny: Quatuor Ebene. Performer: Václav Luks. Ensemble: Collegium 1704.